Just Baked is a new Bakery and Pizzeria situated on Main Street Carrrick on Suir . We bake every batch from scratch! We bake the best pizzas in the South East! We have delicious confectionary of fresh cream buns, a selection of croissants, pain au chocolat and breads and much more, baked fresh each day! 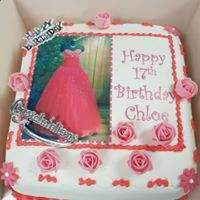 We specialise in personalised Birthday Cakes with a favourite photo of your loved one, just email us the photo, order by phone or in store today and collect or we will deliver tomorrow. We have a huge selection of pizzas or just create your own. Our pizza bases are second to none and we deliver to your home. All confectionary and Pizzas delivered locally to your home.